Having lived in Southern Ontario and then here in the Lower Mainland of British Columbia, I just assumed that everyone in Canada had to report for mandatory emissions testing. Not so! Only drivers in certain regions of Ontario and BC are required to submit their vehicles for emissions testing. Emissions testing began as a way to reduce pollution in high traffic areas. 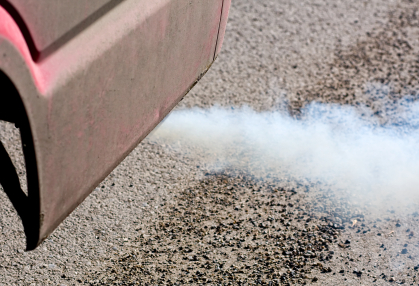 In BC, the emissions testing program is called AirCare - in Ontario, it's Drive Clean. Other provinces have introduced legislation that may one day lead to mandatory testing, but for now, emissions testing outside of Ontario and BC is voluntary. As the proud owners of a 2006 Saturn Vue, our vehicle was exempt from emissions testing for the first seven model years. This year, in order to renew our ICBC insurance, our vehicle (we call her "Chloe") had to go in for her first emissions test. We drove up to the AirCare centre and waited in line for our turn. The actual test is a two step process. First, we paid our $46 fee while the technician checked over our paperwork and did a visual check of our vehicle to make sure it was eligible for the test. If, for example, there was visible smoke coming from the tailpipe, we would have had to leave, have the car looked at, and then returned for a re-inspection. Fortunately, Chloe was in good shape, so the test could proceed. The second part of the test was the on-board diagnostic testing. This test interacts with the existing manufacturer-installed computer in our vehicle that monitors emission-related components to make sure that everything is functioning normally. After a few minutes of running the car and checking things out, Chloe got a clean bill of health and we were on our way. The whole thing took about 10 minutes. We were thrilled to have gotten a passing grade but failing your emissions test isn't the end of the world. Barring a technical glitch, failing your emissions test generally indicates that your car is giving off significantly higher emissions than a properly functioning vehicle of the same year and model. While it may be a hassle to take your car in, the overall improvement to your vehicle's operation and fuel efficiency will be worth it. If you take your vehicle in for regular maintenance and it's operating well, chances are your vehicle is in good shape when it comes to emissions. Between emissions testing and advances in vehicular technology, vehicle emissions have declined considerably over the last few years. For example, in the early 1990s when the AirCare program started, approximately 150,000 vehicles failed the test annually. In 2012, only 39,000 vehicles failed the test. The emissions testing procedure is also evolving; in fact, by the time we have to take Chloe in again (Spring of 2015), the emissions testing process will likely have changed completely. So I'll have to update this post in 2015! Do you have questions about mandatory emissions testing in your area? Visit AirCare or Drive Clean for more information.